DICE.com is a Tech Recruiting site that wanted to appeal to a younger talent pool than it traditionally had. 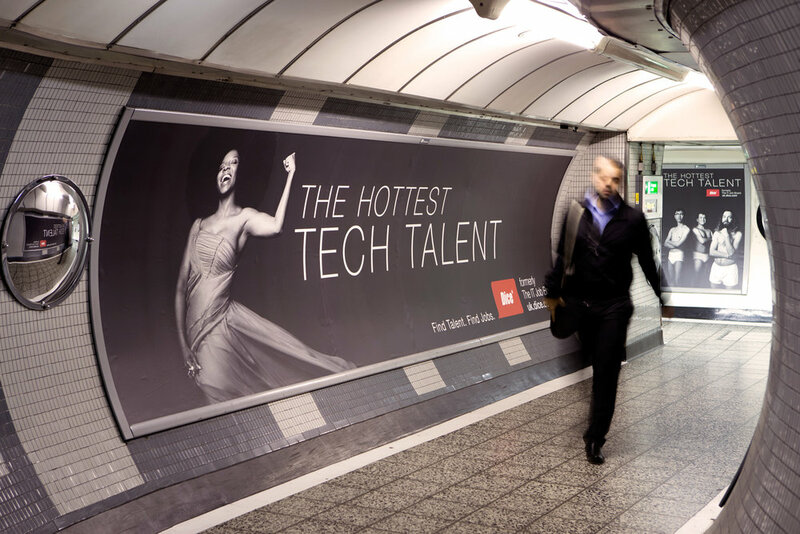 It started as a simple billboard request but we were able to capture and make additional content that ended up as online video, strategically targeted OOH, and an entire Underground Station in East London's Tech City (Silicon Roundabout). The goal was simply to let young tech professionals and tech recruiters know DICE has the best pool of talent. So we took a simple headline, inspiration from fashion ads, and real working professionals to show the provocative side of tech. Knowing the majority of London's tech elite travel through this station twice a day, the UK office worked with us to modify our billboard creative into a whole station take-over. I laid out every conceivable combination for each of the different placements and then used a map to make sure the creative was dispersed correctly throughout the station.